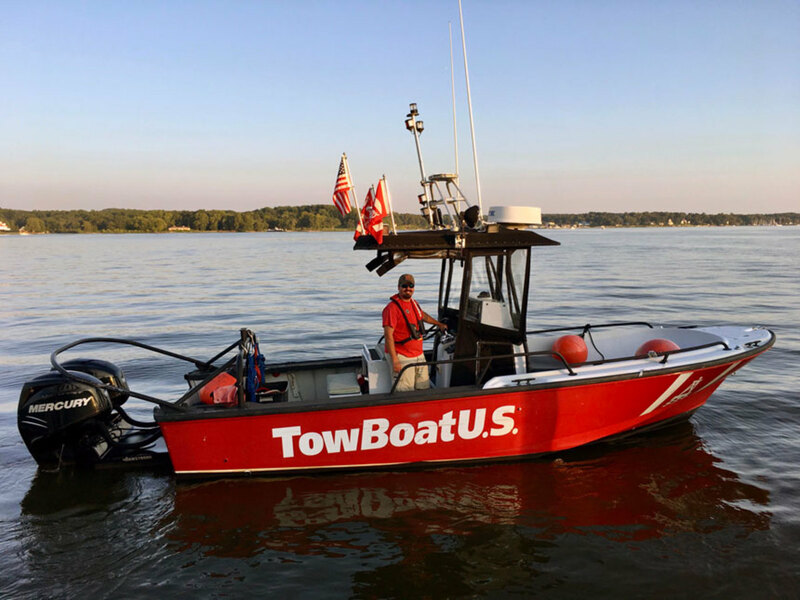 Captain Brandon Meshey is the new owner of TowBoatUS Chesapeake City, a 24-hour towing and assistance service for recreational boaters in on the upper Chesapeake Bay area in Maryland. “Becoming a TowBoatUS owner has allowed me by combine my passion for boating with helping people who may be having a bad day on the water,” said Meshey in a statement. He and his wife Christina, who helps run the company along with their two sons, have called Chesapeake City for years. In addition to the Chesapeake City location, they own TowBoatUS operations in Georgetown, North East and Bear, Md., covering the top of Chesapeake and Delaware bays and the C&D Canal. Meshey’s fleet includes four response vessels with red hulls and the white TowBoatUS logo and the boats are rigged for towing, jump-starts, fuel delivery and soft groundings. In addition to the TowBoatUS services, his companies provide salvage services such as refloating sunken boats. He is in the process of upgrading to a 20-foot salvage trailer. Boaters can reach Mershey’s TowBoatUS ports by hailing on VHF channel 16, by calling the company direct at 401-885-5988, by phoning the BoatUS toll-free 24/7 dispatch center at 800-391-4869 or via smartphone with the new BoatUS App. Additional information can be found at BoatUS.com/Towing or call 800-888-4869.